The pervasiveness of mobile devices demands companies must be aware of the experience they present to users. There are plenty of mobile testing tools available for 'Net-based businesses on the market today. 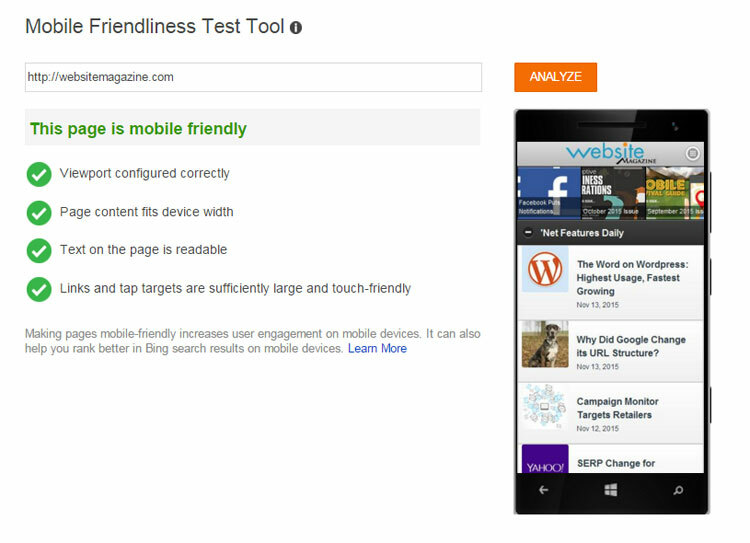 Google, for example, has long offered a mobile friendly testing tool (available here) and now Bing has released their own offering (see screenshots below or test out your own site's mobile friendliness with Bing here). You might recall that Bing began showing mobile friendly labels in the results (just like Google did) a few months ago and even announced it would be rolling out a mobile-friendly algorithm (just like Google did), so the new and free testing tool will likely not come as much of a surprise to industry watchers. That being said, the release of the tool does indicate Bing (and Microsoft's) seriousness when it comes to anything and everything mobile. The search engine went into some detail about how pages are determined to be mobile friendly and the criteria it uses including viewport and zoom control configuration, page content width, readability of page text, link spacing and the use of compatible plugins.